Deer Creek Rd. on the northern edge of California’s Malibu Canyons is narrowing to a lane-and-a-bit of pockmarked pavement with dirt-dusted corners. It’s a motard road, which likely isn’t what Kawasaki had in mind for what they’ve dubbed a “top-of-the-line sportbike with touring capabilities” or “supersport touring” bike. We round a corner and brown is everywhere. It’s a tight fit, but chucked between the gravel shoulder and a UPS truck the early release 2008 Concours 14’s handling responds adroitly revealing this bike as something important – a sportbike for grown ups. Introduced in 1986 the Kawasaki Concours hasn’t seen a major rework for over 20 years, which in “bike years” makes it quaintly Jurassic. 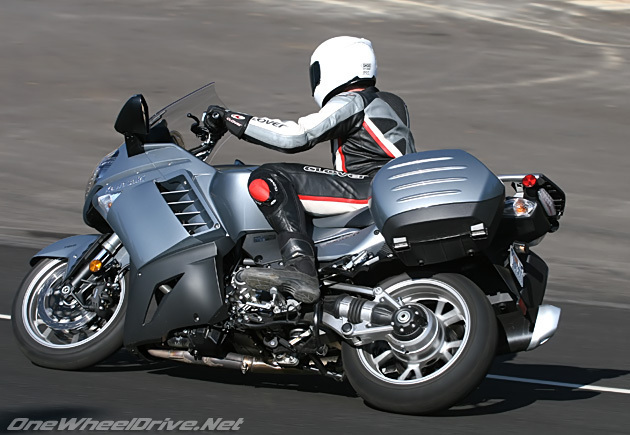 The 2008 Concours 14 isn’t an upgrade, but a completely new ZX-14 based bike with a spec-sheet designed to kick-start a reviewer’s reflexive adverb abuse by featuring the ZX-14’s inverted forks, wave brake rotors, radial-mount calipers and master cylinder, aluminum monocoque frame (reworked for shaft-drive), 10-spoked rims, ram air, and still beating 1,352cc liquid-cooled DOHC 16-valve inline-four heart. Gobs of torque; spread buttery thick across the rev range from down low at 2500RPM to a peak 100.3 lb-ft at meager 6,200 rpm courtesy of variable valve timing. Unlike Honda’s insufferable V-Tec, the Kawasaki system is utterly seamless, as low-pressure oil and minimal moving parts hydraulically advance or retard the intake cam through a 23.8-degree range based on throttle position and RPM. The valve-timing along with the 4-2-1-exhaust system that houses two catalytic converters aims to make “team green” an earth friendly moniker. You could simply be spirited along on this liquid smooth magic carpet of torque at 4000RPM in overdrive (6th gear) content with the continent crossing 85mhp. Until you discover this engine is twist and go… like Hell! Sweep the tach past 5000RPM, and an unobtrusive tingle plays across your nervous system through the bars and pegs. By 6500 the speedo is jolted upwards and the engine note sheds the electric car whir and hints at rough Kawasaki inline four sound, singing a quiet requiem for the likes of the Honda ST1300. By the 10,500-rpm redline the world plays by you like a cartoon stop motion speed-effect. Old Connie owners, bring your heart meds, your pump is about to be in your throats. Kawasaki has kept peak horsepower mum, perhaps rightly so. At a Mulholland Highway lookout a few younger local riders reveal that the Concours 14 has “street cred” thanks to its ZX14 lineage. That broadens the Concours’s market beyond sport-tourists. 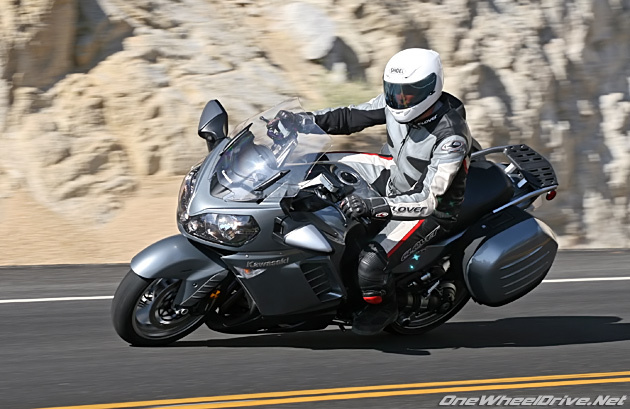 To hold the interests in a market segment that reads “hp” but rides on “lb-ft” Kawasaki will need to minimize comparisons between the Connie and ZX-14 – lest the Connie’s finer points be missed; like the atomic torque or phenomenal handling. 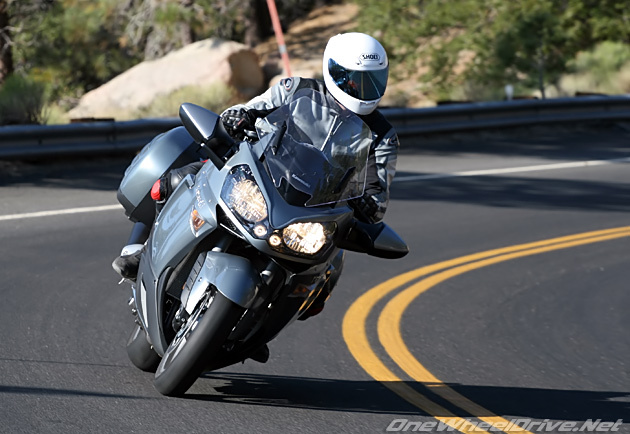 The next day, on Pine Canyon Road, I wave an R1 rider past… only to have the Concours’s sporting spirit take me. Charging in pursuit of fast company the Concours is holding its own, revealing the truth in Kawasaki’s “sport” peppered marketing; ride the Concours 14 like a sportbike and it responds in kind. Into a turn I’m trail-braking with the unlinked binders. A pull the right lever sees twin floating 310mm petal-shaped rotors gripped by a pair of four-piston, four-pad radial-mount calipers actuated through the radial master cylinder. They’re a bit numb feeling, but miles better than the competitor’s linked systems. Out back the 615-pound (claimed dry weight) Concours 14 merits extra stopping power from a 270mm rear single petal disc that’s 20mm larger than the ZX-14’s. Running hot into another turn and… Whoops! A bit too much front brake sees the ABS pulse to life. It’s a nice safety-blanket but seems quick to activate under hard riding. At pace the rough road works the suspension hard. The front end feel is enigmatic, requiring trust in the stout 43mm inverted forks on which we’ve increased preload and rebound from the stock settings. The Connie hides its mass exceptionally well; save occasionally pushing the front end and a top heavy feel at low speeds. While in the rear, the bottom-linked shock features step-less rebound adjustment and handy hydraulic remote preload adjustment. A sensitive deal a only a half turn towards hard accommodated a 100lbs luggage thanks to a bodged-on Ventura top-bag and 200lbs of rider and leathers. Hanging off with the knee out and inner peg weighted hard (impossible to do in leathers on a tourer without looking like a complete fool) and the Concours heels around tight corners easily. Kawasaki succeeded in creating an even weight distribution and neutral feel in transitioning from the ZX-14 chassis from sportbike to sporttouring. Accelerating hard out of a sweeper’s apex I’m being ham-fisted with the throttle in the name of testing. The Kawasaki Tetra-Lever Shaft Drive System, a 4-link swing-arm, aims to eliminate shaft drive torque-reaction under abrupt throttle inputs and deliver chain smooth final drive response. It succeeds. Phenomenal! Quick down a straight the R1 rider waves me past. I drop two gears into first through the positive and smooth transmission, letting the slipper clutch match the engine and gears as we burn off speed. Between it and the Tetra-Lever I can’t force the rear end into hopping or create driveline delay or lash. Eventually we catch our collective breaths at the Rock Inn in Lake Hughes, and the R1 owner, Brian, introduces himself. “Man, on that bike with the white helmet I though you were a cop. Then I was, ‘What the hell? No cop rides like that.’” Pray the Concours never becomes a police bike – speeders wouldn’t stand a chance. Ditching the electrically adjustable screen would be a mistake, the optic quality is fabulous and raised slightly is creates a good airflow for taller riders. Beyond those first few centimeters though the screen creates buffeting and a vortex that pulls heated engine air up and over the rider. Not useful for the deserts relentlessly hot summer days, but in Coast’s cold marine layer it’s a perk. Heat aside; the Concourse 14 is one of the most comfortable bikes we’ve tested – ever. The 32.1-inch high saddle is broad, well padded, and supportive – 8-hour days cosseted in this are issueless. The position is upright, relaxed, well protected and provides plenty of room at the leg and arm. I’ve sat in less comfortable recliners, and certainly not ones whose suspension turns I-5 super-slab into 85mph of pillowy smoothness. Even stock the Connie begs for Trans-North America crossings in search of great roads and unsuspecting sportbikes. Part of that is because throughout the Connie reveals itself one of most complete and thought out touring bikes on the market. The bags are capacious, and are some of the easiest to remove, attach and open in the class – what more could you want? A tank-top glovebox maybe? Oh, wait there is one and it gets hot enough to bake in, how useful. The left and right headlights are adjustable independently from the dash, and have excellent throw and intensity. The bike lifts onto its center stands easily, and rolls off likewise. The integrated mirrors are vibe free and fold inwards if nicked, while lane splitting (not recommended on a bike this wide). There’s even a power socket on the dash’s right side, perfectly located for a strongly recommended radar detector. The central LCD panel presents a plethora of pertinents; fuel, odometer, dual trip meters, clock, current and average fuel consumption (30.5mpg over our 750 miles of testing, calmer riders will get significantly better millage), battery voltage, a gear-position and (gasp for breath here) tire pressure, which only reads if you’re moving 12.5 mph/20kph or better. Unfortunately this info-center displaces the gauges from the eye’s natural fall and the buttons switching between the readouts are a bit fiddly to operate with gloved hands. Rounding off the electrickery is KIPASS, the Kawasaki Intelligent Proximity Activation Start System. When placed within 5.25 feet/1.6m of the bike the KIPASS transponder/fob lets you forget about such a mundane item as a key allowing the ignition be switched between On, Off, FSS (Fuel-Seat-Storage – which lets you removed the key the ignition to access these areas) and Lock. Just press the key and turn. Smashing, no more digging through gear once gloved up looking for a forgotten key. The only counter intuitive aspect is that locking the steering requires you to leave the key in the bike, while the KIPASS ECU disables it. Should someone make off with the bike while it’s still running or you lose the fob, the anti-theft logic will allow the bike to be ridden, but with the display will alternating between the key LCD symbol and “No Transponder” on the display. Once the bike is shut down the rider has a 10-second window to restart it, after that the Connie becomes a plastic and metal roadside sculpture. Back in ’86, Knight rider had to put up with a chatterbox car for this sort of security, and visually a Firebird can’t compete. Waiting roadside for Kevin to return the fob after a forgetful bike exchange, it strikes me that there is nothing modest about the 14’s design. 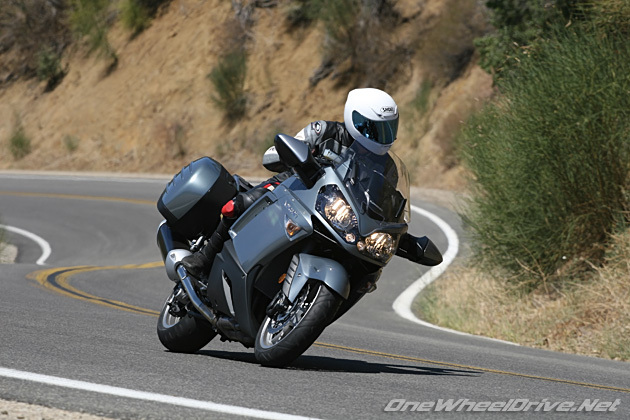 The blunt front is reminiscent of the FJR indicating the underlying touring function to all this sporting form. While in profile the unrestrained use of strakes invoking Ferrari’s classic Testarossa and breaks up the bike’s formidable visual mass a sporting touch and a hint of 80’s retro. It may not be to all tastes, but it is striking. 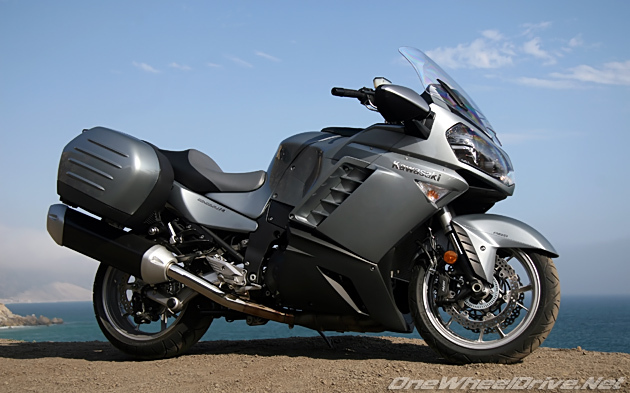 Kawasaki has had 20-plus years to get the 2008 Concours 14 right and it shows. This is one of the most comprehensive, thoroughly thought out, and successfully executed bikes we’ve reviewed. Epochal, the reborn Concours 14 is a fine balance between opulent comfort, exceptional handling, prodigious power and sporting sense. 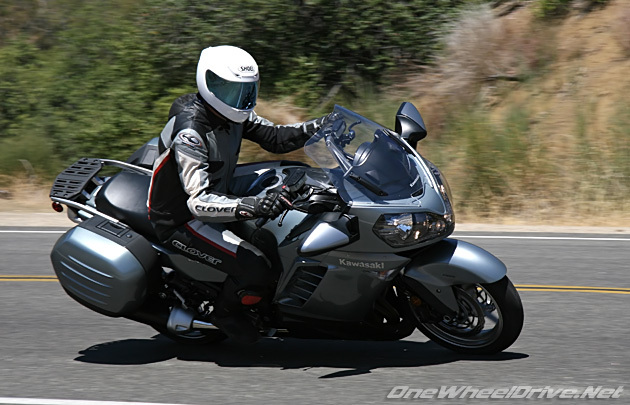 Some would worry that moving to a sport-touring bike is a sign of giving up your youth, instead given the Kawasaki Concours 14’s prowess it feels like you’re extending it… across continents. Next Post Avon Viper Sport – Trick! Thought you might want to know, Idaho State Police and Oregon are utilizing this as a Police bike at this time. I work with several of them and the bike does indeed make a fantastic police bike. Cross Idaho and Oregon off the list of places where you can outrun the cops then.